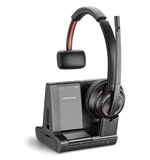 Plantronics Savi 8210 is a wireless headset that connects to a desk phone, PC, mobile phone calls. The Savi 8210 wireless headset system provides the freedom of long‐range wireless communication. If you have a noisy office, and if you need to concentrate, active noise canceling (ANC) in the speakers block out most of the background noise. or you can use it to listen to music on your smartphone or PC. In addition, the noise‐canceling microphone filters out background noise for your the caller on the other end. It simply has it all.